This Pantech IM-U140, which looks quite similar to my T-Mobile MDA, has an auto-popup screen that moves up to a 30-degree angle when users press the button. 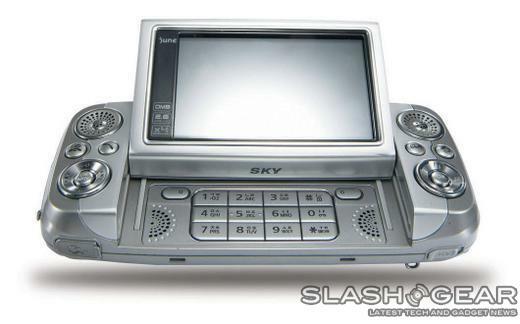 The screen is 2.6-inches wide, is QVGA, and plays back DMB TV. The phone itself has a 3 megapixel camera and PictBridge, so you can print out the pictures easily. There's also TV-Out so you can play the DMB on a real TV, 4 channel stereo speakers, and a touch screen. Slim chance this phone or anything like it will be available to the US in the next year or two.